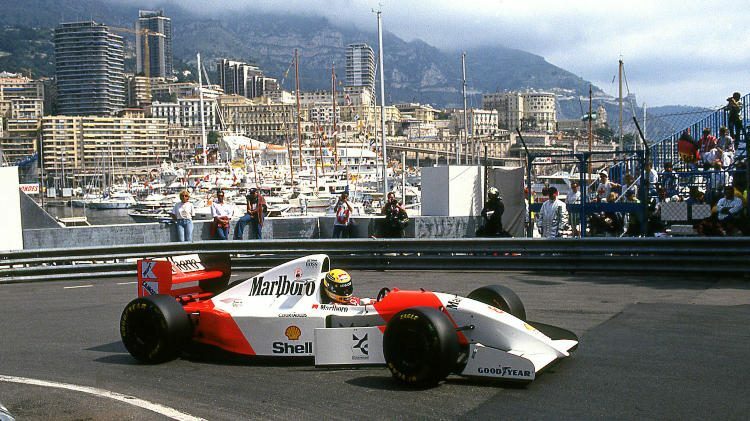 The 1993 McLaren-Cosworth Ford MP4/8A Formula 1 Racing Single-Seater that Ayrton Senna drove to his record sixth Monaco Grand Prix victory is the clear lead car for the Bonhams Monaco 2018 sale. Ayrton Senna’s Monaco 1993 Grand Prix winning McLaren-Cosworth Ford MP4/8A Formula 1 Racing Single-Seater on offer at the Bonhams Monaco 2018 sale is likely to be one of the classic car auction highlights of 2018. Senna won his sixth and final Monaco Grand Prix in this McLaren. Senna magic is also likely to spread to the car that he raced to a superb second place his Monaco Formula 1 debut – a 1984 Toleman-Hart TG184 Formula 1 Racing Single-Seater. 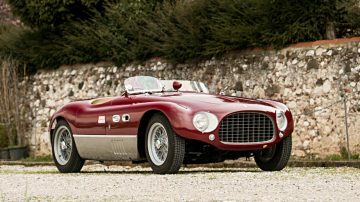 Further highlights in the sale include a rare 1953 Ferrari 625 TF Two-Seater Spider, a 1957 Mercedes Benz 300 SL Roadster and a 1931 Bentley 8-Litre Tourer. 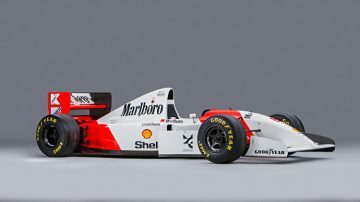 The 1993 McLaren-Cosworth Ford MP4/8A Formula 1 Racing Single-Seater, chassis MP4/8-6, leading the Bonhams Monaco 2018 sale is undoubtedly the most-exiting car on offer at public auction this year. Ayrton Senna won his sixth, and final, Monaco Grand Prix race in this McLaren. This racing car is not only in fully working condition but also sports the original V8 Cosworth-Ford engine and gearbox that Senna used in the Monaco Grand Prix race in 1993. During the 1993 Formula 1 Grand Prix season, Senna also raced this particular chassis at the Spanish, Canadian, British, German, Belgian and Italian Grand Prix but it is obviously for the Monaco victory that the car is famous. McLaren MP4 cars are rarely privately owned and even rarer to be offered at auction. The Senna mystique adds to the value while his record sixth Monaco GP victory in this McLaren will add a lot. Bonhams has not released any price guidance or estimate for the McLaren but it is likely to set some records. The most-expensive Formula 1 single-seater ever sold at public auction was the 1954 Mercedes Benz W196R that achieved $29,650,000 at the Bonhams Goodwood Festival of Speed sale in 2013. This car is still the third most-expensive car ever sold at auction and the most-expensive German car ever. The record for a modern Formula 1 car is the 2001 Ferrari F2001 that Michael Schumacher drove to his fifth and final Monaco GP victory that achieved $7,504,000 at the Sotheby’s Contemporary Art sales in New York. The result was well in excess of RM Sotheby’s pre-sale estimate of $4,000,000 to $5,500,000. A second ex-Ayrton Senna, ex-Monaco podium finish racing car will be on offer at the Bonhams Monaco 2018 sale: the 1984 Toleman-Hart TG184 Formula 1 Racing Single-Seater, chassis TG 184-02, that Senna raced to a splendid second place during his debut Monaco Grand Prix in 1984. In the very wet and action packed 1984 Monaco Grand Prix, Senna was actually leading the race when it was stopped. As per rules, the order of the preceding lap determined the results giving Alain Prost the victory and Senna a still incredible second place and his maiden Formula 1 podium finish. Senna also raced this particular chassis in the 1984 French, Canadian, US (both Detroit and Dallas) and British Grand Prix races. It was raced later by Stefan Johansson, who owned this chassis for a decade, at the Italian, European (Nürburgring), and Portuguese races. The restored and fully functional car is, not surprisingly, in the specification and livery used during the 1984 Monaco Grand Prix. 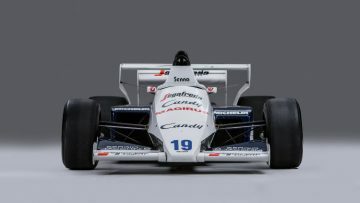 Senna not only gave Toleman their first podium finish ever, his connection to the car is likely to set a marque record at auction too. The estimate is €750,000 to €1,000,000. The third formula 1 racing car on offer at the Bonhams Monaco 2018 sale is a 1987 Ferrari F1/87 Formula 1 Racing Single-Seater, chassis 100, estimate €650,000 to €850,000. This car was the last of the Enzo Ferrari era Formula 1 cars and the chassis number indicates the hundredth Formula 1 Ferrari chassis built since the consecutive numbering system was introduced in 1961. This 1987 Ferrari F1/87 Formula 1 Racing Single-Seater was driven by Michele Alboretto at the Hungarian, Austrian, Italian and Portuguese Grand Prix races. Unfortunately, chassis 100 retired from all these races with reliability issues. At the RM Sotheby’s Monaco 2018 sale, an ex-Michael Schumacher 1992 Benetton B192 and an ex-Heinz-Harald Frentzen 1999 Jordan 199 formula 1 cars will be on offer. The car with the highest published estimate for the Bonhams Monaco 2018 sale is a 1953 Ferrari 625 TF Two-Seater Spider, estimate €4,500,000 to €6,500,000. It is one of only three versions built with the 2.5 liter, 4-cylinder engine. This ex-works Targa Florio racing car with coachwork by Vignale was campaigned in period by amongst others Mike Hawthorn, Umberto Maglioli and Luis Milan. After a couple of races in Italy, it spent much of its early racing years in Argentina and Paraguay before returning to Italy in the mid-60s. After years of neglect – and temporarily using a Lincoln V12 engine – the 625 TF was restored in 2002 and competed in many historical races. The 1957 Mercedes Benz 300 SL Roadster, estimate €950,000 to €1,150,000, is a fully restored example with matching numbers – chassis, engine and body. During the 2007 restoration, the lights were changed from US to European specification and the color scheme from the original white over red to silver-grey over dark blue. It has covered only 79,000 miles since new. Large Bentleys have sold well at recent auctions and the 1931 Bentley 8-Litre Tourer, estimate €800,000 to €1,000,000, on offer at Bonhams Monaco 2018 is also expected to achieve more than a million dollar. This car is one of 100 built of which around 80 survived to the present. The car was originally a limousine used in Singapore but returned to the UK after the war. The chassis was shortened for racing. The car was fully restored in 2002 and returned to the correct chassis specification with a four-seat body fitted. The 1973 Porsche 911 2.7 Carrera RS Touring, estimate €550,000 to €750,000, is unlikely to become the latest 911 to break the million-dollar mark but it is a car worth noting. In contrast to the RS Lightweight, of which one with 60,000 km on the clock is on offer at RM Sotheby’s Monaco 2018, the Carrera RS Touring was aimed at driving rather than racing. The four owners of this Carrera RS Touring took that seriously: the car has 248,000 km on the clock – almost half of that driven in five years by the original French buyer. Meticulously maintained, the car is considered in a very good and original, unmolested condition. The only downside seems that the next service is due in June. The previously announced 1959 BMW 507 Roadster originally owned by King Constantine II of Greece has been withdrawn from the Monaco sale and is likely to be on offer at auction during the second half of 2018.